Bitcoin! 13,000 USD per day! Autopilot trading software! FREE! Well, I guess it’s our lucky day, ain’t it? If you are still looking for that amazing piece of software that will make you rich beyond your wildest dreams, look no further because Bitcoins Wealth is here and you have access to it for free. It’s your winning lottery ticket… or is it? Keep on reading to find out. This auto-trader software has been created by Steve Robinson, who was a mid-level software engineer in a big Wall Street company just three years ago. Now he is a multimillionaire, dubbed by Wall Street traders as the 100-Million Dollar Man. In three years he went from IT guy to trader wizard? Hmm, I wonder how that feat was achieved. One day his boss came to his desk and handed him a top secret project for a software that was supposed to trade Bitcoin on autopilot, without the need to actually buy the cryptocurrency. He said the request was from the “guys at the top” and he wasn’t supposed to talk to anyone about it. After a full year of hard work, Steve finally finished coding the software and delivered it to his boss. After a few days, he received a phone call from a blocked number – oooh, the plot thickens- it was his boss who had fled the city with the software. He told Steve to never speak to anyone about the software (again). So, actually, the initial request wasn’t from the top management but from Steve’s boss (WOW) who wanted the software for himself… wowoow! So what was Steve supposed to do now? Well, like anyone in his situation, he tried the software for himself and made 13,000 USD during the first 24 hours. Is he actually trying to tell me he worked on the program for 1 full year, delivered a finished project but in all this time he didn’t try the software to see if it functions correctly??? But let’s forget about that for a moment and focus on the other elephant in the room: the app makes 13K per day on autopilot (LOL) and because he can make that much money with it, everybody can, so he will share it with 25 lucky guys. Yes, that’s his reason for sharing such a gem with the world (oh and by the way, those limited 25 spots are actually unlimited; it’s an overused sales tactic). The sales video is fictitious, actors have been used and it should be viewed for entertainment purposes only. There you go. For once I agree with these robot creators. The rest of the video is more brainwashing and big words about the gigantic sums of money that you are about to make every day. And they even give some advice on how to spend it: fly your friends around the world in jets, buy your best friend a house, go on endless vacations. Ok, thank you for letting me know how to spend my fictitious money. There are so many scams like this one that I can hardly keep up. Seems like every day a new one pops up or an older one is rebranded as something new. Bitcoins Wealth is very similar to Bitcoin Code and actually, they’ve changed only a few things (including the name of the robot and its millionaire creator) because probably people started to realize they are being taken for a ride. How these robots really work is they make you sign up for one of their recommended brokers (minimum deposit is usually $250) and receive a commission for bringing in new clients. In fact, there’s a distinct possibility that some brokers create their own software like this one in order to attract more clients. However, I have no way of knowing that for sure. 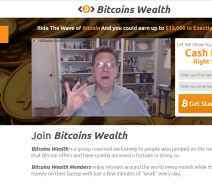 What I do know is that Bitcoins Wealth will NOT make you 13,000 USD on autopilot. Your money is safer in your pocket but if you want to trade, please learn to do it yourself or seek professional investment advice.